Liverpool won the League championship SIX times in NINE seasons under Bob Paisley in 1976, 1977, 1979, 1980, 1982 and 1983. Liverpool won the European Cup THREE times in 1977, 1978 and 1981 and the UEFA Cup in 1976. Liverpool won the League Cup THREE years in a row in 1981, 1982 and 1983. Bob Paisley was voted Manager of the year: 1976, 1977, 1979, 1980, 1982 and 1983. His record speaks for itself as the most successful manager in Liverpool's glorious history. In addition to the above honours, Bob Paisley's Liverpool also finished as League runners-up twice, won the Charity Shield on 5 occasions, reached 2 F.A. Cup semi-finals and 1 League Cup semi-final. During Paisley's reign, Liverpool set an all-time record of 85 home games unbeaten in all competitions. This run included 63 league matches and stretched over 3 years from 7th February 1978 to 31st January 1981. The lost This is Your life show with Bob Paisley discovered! This is Your life with Bill Paisley is no longer lost - It has been uploaded on YouTube for all to enjoy! The show was recorded on 12th November 1977 and broadcast on 28th December 1977. The original recordings had been destroyed and it was only in the faint hope that someone who had recorded this on VHS back in 1977 would one day upload this. That has finally come true thanks to a man by the name of Pete Day. Jessie Paisley who was married to Bob Paisley for half a century died this Wednesday morning 96 years of age. "She was the driving force behind my dad," son Graham told LFC.tv today. "She idolised my dad and was very much Liverpool Football Club through and through. In fact, the last piece of good news she got was the team beating the two Manchester clubs in the cups - she was very pleased about that. She was so fully supportive of what my dad did - she was always 100 per cent behind him. There was no side to her and she never begrudged the time he'd have to spend away from home. "She was a schoolteacher most of her working life, so when my dad was off on his travels, she was very much the one in charge of the family. She controlled what was going on and even controlled my dad when he was at home - she was a very organised lady. In many ways, she was his unpaid secretary and would help him write speeches and respond to correspondence. Obviously the demands of football were different back then to what they are now, but she was very protective of his limited home life. If he came home and things were stressful, she knew when to say something or when not to mention anything about games - she got the balance right most of the time." Paul Tomkins' book, Dynasty, is a reassessment and an in-depth analysis of every manager of the club over the last 50 years. 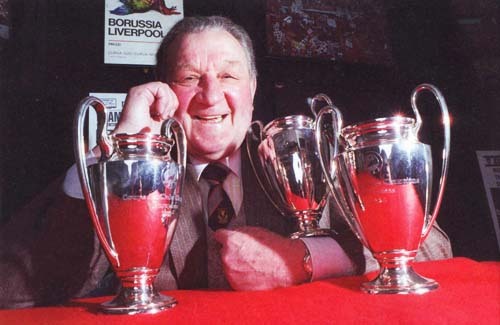 Bobpaisley.com offers you an exclusive look into an abridged version of Dynasty's chapter on Bob Paisley. Read Paul Tomkins on Bob Paisley. "Graeme tosses up before kick off with a gold plated credit card."